In my previous blog on the three challenges facing higher education fundraisers, I talked about how increased competition for dollars, changes in communication, and shifting donor expectations have made the fundraising landscape more difficult than ever. While these challenges might feel daunting, there is an incredible and exciting opportunity to modernize fundraising with new tools and tactics that can have a truly revolutionary impact on giving. To meet today’s demands, institutions must shift the way they approach fundraising. 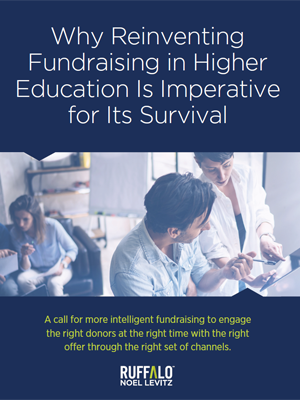 Higher education fundraisers need to adopt new strategies that leverage advanced analytics, new engagement models, and insights to be able to scale, connect, and see a greater return on their fundraising investment. From student philanthropy to planned giving, from alumni engagement to a multi-million-dollar major gift, donors have shifted to expect a new level of interaction and customization. The good news is that the data, technology, and a compelling impact opportunity already exist to communicate with students, alumni, and other members of the community. The priority now is to weave them together in a more intelligent way to more effectively engage donors and create a rewarding habit of lifetime giving. Let’s be clear: traditional segmentation based on old-style heuristics will no longer cut it. Advanced analytics, predictive modeling, and engagement scoring will help you identify the right donors most likely to give, focusing your time and resources in the right ways, making your programs more efficient, and resulting in a higher return on your investment of money, time, and people. These same techniques will also help you fine-tune your methods and messaging to ensure you are sending the message most likely to resonate with any given donor. In addition to leveraging new techniques like targeted digital advertising, marketing automation, and adaptive engagement technology, a modern approach to building a relationship with donors weaves together the right channels for the right donors at the right time. Move beyond a simplistic multichannel view of blasting the same message across all channels, and create a personal journey that tailors your channels and cadence based on the campaign and audience. All channels—including digital, email, social, phone, direct mail, events—working together creates a more compelling donor-directed experience. Donors want to understand how your work is relevant not only to their experience with the institution, but also how it connects to what they care about now. They need to know the specific, tangible impact their gift will have. Use the insights that you gain from your data and a donor’s own actions to move away from a scripted transaction and instead create interactive, dynamic giving experiences that speak to an individual donors’ expectations and why they give. Allow for giving to take place at any time, at any level, and through the giving methods the donor chooses. Finally, take a holistic view of your donors—from acquisition to transformational giving—and connect these same principles throughout your fundraising operation, tying them together so a donor’s journey with your institution gets more compelling and rewarding with each step. From student philanthropy to planned giving, from alumni engagement to a multi-million-dollar major gift, donors have shifted to expect a new level of interaction and customization—it’s time to shift along with them and reinvent fundraising in order to reinvigorate higher education philanthropy. Download our white paper, Why Reinventing Fundraising in Higher Education Is Imperative for Its Survival. It covers the three challenges and three strategies discussed in my blogs. I also encourage you to ask for a free consultation with our fundraising strategists. Ruffalo Noel Levitz has partnered with hundreds of colleges and universities. Talk to us about how you can increase donor engagement, connect with donors who are ready to give now, and build a lifelong giving relationship with them. Ask for a free fundraising strategy consultation.